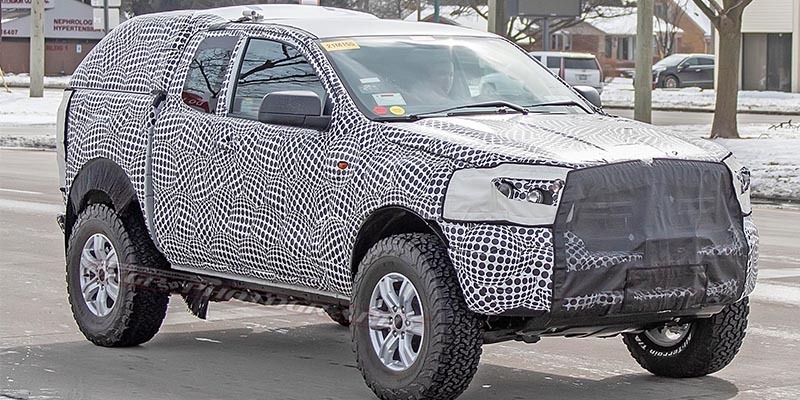 Ford Motor Co. is likely testing a prototype of its upcoming 2020 Bronco disguised as a pickup truck. The automaker took to the streets of Detroit in the mule, or early development vehicle, in the first public appearance of the highly anticipated SUV. The vehicle is wearing a faux pickup bed and separated cabin that initially fooled Trucks.com into thinking it was the upcoming Courier compact truck instead. But the tiny bed, short wheelbase and meaty all-terrain tires point to the Bronco. The Bronco name is synonymous with off-road adventure, and the prototype’s aggressive approach and departure angles indicate the new model will continue that reputation. The 2020 Ford Bronco will be based on the body-on-frame platform used for the Ranger midsize pickup truck. While the vehicle pictured features black drapery covering its frame and suspension, its emphasis on trucklike dimensions and apparent lifted ride height are clues that this is a Ranger-based Bronco. The Bronco prototype wears all-terrain BFGoodrich tires suited for venturing off pavement at a moment’s notice. Additional grip from that rubber, plus extremely short front and rear overhangs, lend the Bronco a boxy stature that is suited for climbing up and over whatever lies ahead. When the Ford Bronco eventually reaches production, it is expected to do battle with the Jeep Wrangler, which has enjoyed the specialty off-road segment to itself for years. General Motors revived the Chevrolet Blazer nameplate for 2019 but opted not to make it a competitive rugged SUV, leaving the Bronco to challenge Wrangler by itself. Ford announced it would revive the Bronco as a 2020 model at the 2017 North American International Auto Show in Detroit. Plans for the new vehicle were included in a $1.2 billion plan to retool some U.S. manufacturing facilities months later. Editor’s note: An earlier version of this story identified the vehicle as a Ford Courier. This is likely the new Ford Bronco? Not a courier pickup. Well i realy thought the ford corperation was smarter than this. If this truly is the bronco ? I think they have made a big mistake. I dont know about anyone wlse but i was hopeful we would see a recreation of 60’s through 80’s style bronco. I do not think this should be called a bronco ,its not worthy of the name. I’ve been told by people in the know, production should start in August.